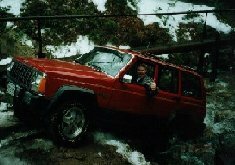 Welcome to my Jeep XJ page. This is where I post Jeep Stuff, photos, information on my Cherokees (90 & 96), Tech articles, and any other Jeep Stuff I come up with. Take some time to look around and enjoy. Let me know what you think, and please don't forget to sign my guestbook, thanks. Tow hook Bracket Kit and Tow Hook install. Tire Comparison.T-Case skid install. Rear Swaybar Removal. 2" lift. Locker install. Lifting Audrey's XJ! Highlift Mount Design and Install. Bill Ansell's Rocker Panel Replacement Skid. My New Custom Rocker Skids! My home made Quick Disconnects. Coming Soon; Transmission cooler install, so check back often. Trip Reports, and future Events - Photos from the Spring Fling Prerun! Photos from the Second GWNF Spring Fling Prerun.Photos from Spring Fling Prerun 3.Photos from Saturday of Spring Fling 99. Big Dog's Spring Wheeling Weekend! NAXJA's Forum Fest 99! Our 5 June 99 Trail Building Trip. Our Labor Day Weekend Install Party. BIG DOG's Sept 99 Main Jambo! Our Up coming events! Check'em out. These are some web rings that I'm a member of. This is a place where Mid-Atlantic Jeepers can come to set up trail rides, lift parties, or just talk Jeep. Need More Off-Road Action? Checkout these top selling magazines. Magazine Description 4 Wheel & Off-Road covers the truck scene for show truck builders, new truck buyers, and hard-core trail and competition drivers. Magazine Description 4x4 Power introduces entry-level enthusiasts to the many aspects of equipping and using a 4x4 vehicle. Magazine Description Field & Stream is America's number one sportsman's magazine. Each issue features in-depth articles on hunting, fishing, and conservation news, as well as first-class fiction. The magazine has offered editorial excellence for over 100 years. Magazine Description For four-wheel-drive enthusiasts and professionals, Four Wheeler features new vehicle test evaluations, hands-on technical how-tos, new products, driving tips, and a calendar of off-road racing events. Magazine Description Off-Road magazine is for light truck and four-wheel drive enthusiasts who modify their vehicles with after market parts and accessories. It covers all facets of the sport with feature vehicles, how-to technical articles, project vehicles, travel stories, lifestyle features, and racing competition coverage. Magazine Description Outdoor Life is written to delight and inform the outdoor enthusiast. Every issue contains up-to-the-minute information on fishing, hunting, boating, and conservation as well as award-winning outdoor adventure stories. Magazine Description Rifle is a journal about sporting firearms. Published 7 times per year, the magazine targets knowledgeable readers who want technical information not found in some mainstream firearms magazines. Each issue offers accurate features on products and helpful pointers on shooting technique. Magazine Description RifleShooter is written for the dedicated and advanced rifle enthusiast who is trying to improve his or her accuracy and aptitude for the sport. Magazine Description Aimed at the sportman interested in wingshooting, bimonthly Shooting Sportsman includes articles on gunmakers, hunting dogs, important conservation issues, interesting places to hunt, and game cuisine. Magazine Description Sport Fishing, the ultimate magazine for salt water fishing, gives you tips on baiting and rigging, instruction on salt water fly fishing, reviews of the latest tackle, tips on fine tuning your boat's electronics, guides to the hottest fishing destinations in the world, information on your next charter, and much, much more. Folks have been by times. Last updated 6 Oct 99.